Truly a poster befitting the horror mastermind behind Phantasm and Bubba Ho-Tep - Don Coscarelli. Magnolia Pictures has finally set an early February theatrical release for Coscarelli's new wacky horror film John Dies at the End, starring Rob Mayes & Chase Williamson and yes, Paul Giamatti, adapted from David Wong's book. The film is playing the festival circuit (Jeremy's SXSW review) and is a truly wacky horror to behold, if you get the chance to see it, which will be at the very end of this year once it hits VOD. This new poster somehow squeezes in almost every weird thing from the film, and does so with funky style. 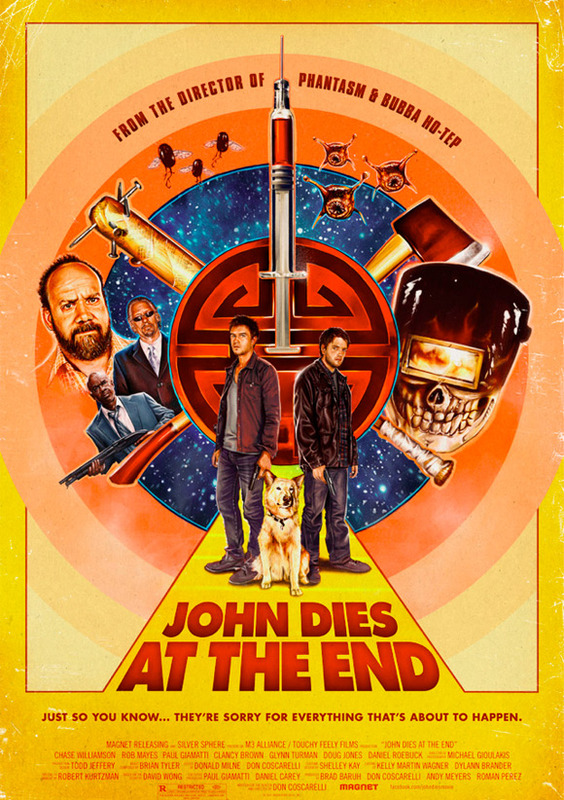 Here's the latest official poster for Don Coscarelli's John Dies at the End, originally debuted by io9. Dig it? It's a drug that promises an out-of-body experience with each hit. On the street they call it Soy Sauce, and users drift across time and dimensions. But some who come back are no longer human. Suddenly a silent otherworldly invasion is underway, and mankind needs a hero. What it gets instead is John and David, a pair of college dropouts who can barely hold down jobs. Can these two stop the oncoming horror in time to save humanity? No. No, they can't. Based on David Wong's 2007 book. Written & directed by Don Coscarelli (Phantasm I-IV, The Beastmaster, Survival Quest, Bubba Ho-Tep). This first premiered at Sundance and will hit theaters on February 1st, plus VOD starting December 27th. Visit: johndies.com. I heard nothing, but good things about it on The Golden Briefcase so I can't wait to see this movie! ha ha ha. Damn geometry and the new world order!